NOTE: The square parentheses, for example [and] , indicate insertion of web publisher's words of explanation to clarify text at times. The following are the written records of various people and groups who experienced contact with "Dr Mac" after his passing in February, 1955. No doubt there are many more occurrences since then over the years. A true and brief account of Herbert and Grace's experiences of materialisation at the residence of Mr. and Mrs. H. (the mediums) in J'burg, S. Africa, in 1958. These are highlights of what they saw and heard. It is divided into four sections, Part 1 through to Part 4, for easier reading. A true and brief account of Herbert and Grace's experiences at the residence of Mr. and Mrs. H. [both mediums] in Johannesburg, So. Africa. On Saturday evening, we went for the first time in our life to Mr. and Mrs. H.'s residence, for a materialisation. The family come from C..., England. Years ago, Dr. Murdo MacDonald-Bayne told us he knew them and used to visit them. "Doc," as we termed him, or "Mac," often visited us here in our own home in Pretoria. Doc was telling Herbert and myself of his experience in the Himalayas in Tibet. In the year of about 1945, Doc was telling us, that his mother had passed over 13 years ago and that while in Tibet, he was at a gathering of the Masters and he asked the Masters whether it would be possible to see and talk with his Mother. Doc said that the Masters said "yes," and after they were all "set," his Mother came and spoke to him in Gaelic, as they used to talk, and they both held each other's hands -- Doc in his physical body and his Mother in the materialised form. Doc said that her hands and fingers were just the same as though in the physical body. Herbert was so surprised and non-plussed and rose from his chair in our lounge and went to Doc and said, "Doctor, as man to man -- take my hand and tell me, was it a vision you saw, or did you really touch your Mother's hands, as I am now holding yours?" Doc replied in his Scotch accent and called Herbert, " 'Harbart,' I held her hands (in the materialised form) as I am holding yours now. It feels exactly the same, and I spoke to her, as I'm now speaking to you in my same voice, and my Mother spoke to me in her same voice. The Masters call this phenomenon, 'Materialisation' ." Doc then said, "Harbart, one day I will materialise to you." Herbert pondered over this and said to Doc a couple of years later, "Doc, you have not appeared to me yet," and we all had a good laugh! Doc said, "One day, Harbart, you will remember my words!" Years ago, 1947, Doc, his half sister, Flora C., L.T., Herbert and myself went out to Herbert's little holding on the B..... road at K ... and Doc divined the flow of water on this holding and told him where to put down another bore-hole. We were the only people out there with Doc and had nearly forgotten this little incident. Doc came over to Pretoria and lectured once a week at Sanlam Building on Tuesday nights. Being very difficult to get a place for Doc to lecture in, I walked the streets of Pretoria and first got a room in Trysa Buildings, which was then held by the women's club, from Mrs. C.B. Later (due to the war) we were able to get the hall of the women's club for one night a week on Tuesday's for Mac to lecture to all of us, as students of Dr MacDonald-Bayne's "College of Universal Science." Doc also did very fine work and healing at Miss Ida Baggot-Smith's home in S.... Street. Doc's Secretary was Mary O. ... .
Doc left South Africa for London in the year 1954, his sister Flora C. accompanying him. On this trip Dockie wrote his books, "Beyond the Himalayas," in which he describes briefly his meeting with his Mother in the physical in Tibet. He also wrote, "The Yoga of the Christ." On February 26th, 1955, my dear friend Mrs. Freda M., wife of Dr. M., phoned me, to say she had a cable from Doc's secretary (who flew over to London to be with Doc), to say that Doc had passed over. Doc and his sister Flora were returning from the cinema in a taxi when Doc had a heart attack. Flora told me afterwards on her return for a short visit to South Africa, that Doc said to her in the taxi, "There is my number 16, I am going," and he kissed her goodbye and leant his head on her breast and passed over. They rushed him to the clinic there but Doc did not survive. He was cremated in London. When I heard the news Freda asked me to phone as many of the students as possible and let them know the very sad news for us all. When I heard the H.'s [mediums, Mr. and Mrs. H.] were in Durban, I immediately tried to get in touch with them. Later they came to J'burg and Mrs. H. phoned me and also wrote to me and later we received a letter from Mrs. C.J. saying we could come to their gathering on Saturday night, January 1958 at 7.30 p.m.
We were introduced to Mr. and Mrs. H. and approximately 14 people, all perfect strangers to us. Mr. H. took Herbert and myself into their little sanctuary. On the wall was a picture of Christ. Then a painting done of an Indian, whom they named "White Wing," a spirit portrait of a beautiful woman, and one picture of a bright, beautiful face of an Indian girl. One corner of the room hung a black silk curtain. This corner of the room was partitioned off with a bar across, on which hung two black silk curtains. Behind these curtains was an ordinary chair on which Mr. H. sits when he goes (out of his body) into trance. The curtains are let down so there is no glimmer of light on him, as light would hinder the medium and damage his physical body (just like a sensitive negative in being developed in photography). In this sanctuary, above the picture rail, were four small red globes. When the large electric globe is switched off then they switch on these tiny red globes to make a subdued reddish glow. When the guests were seated in a semi-circle facing the corner of the room where the black silk curtain hung, Mr. H. sat in his chair behind the closed black silk curtain. There were two rows of chairs approximately six feet away, on the outside of the two closed curtains. I was seated in the front row with Mrs. H. on my left and Herbert on my right. Next to Herbert was Phyllis C. Phyllis' husband, T.C. was seated in the second row. T.C. always sits there. Mr. H. was robed in black silk pyjamas and jacket; the black pyjamas and black curtains are for the purpose of showing the materialisations, as these forms build up in the white ectoplasm taken from the body of Mr. H. and the sitters. Mrs. H. explained to us all to come with an open mind and not long and wish or request any person or relative or friend who has passed over, to come to us, as this creates a psychic barrier and the beloved one usually does not materialise. Mrs. H. also explained to all that when a form materialises they are strange and we must talk lovingly and gently to them and say, "Dear Friend, we love you, do come. We are so pleased to see you," even if we do not know who the dear soul may be. We must not touch them, until they come to us and they call our name and then, when they give us their hands to hold, we must hold and touch their hands gently, and on no account grip their hands tightly, as this reacts very badly on Mr. H., the medium. Mrs. H. linked hands and said a beautiful prayer and "Our Father." Then we all joined in the singing to keep the vibration going. We all sang "Silent Night." Then a white little form of a child of ten years of age called "Sonny Boy" appeared. He walked towards Mrs. H.'s chair and took her hands and spoke to her in English, so that we could all hear what Sonny Boy said, " 'Aunty Lou' I cannot 'rummage' tonight as the scientists won't let me." Mrs. H. replied, "Well, do what the scientists wish and look after uncle H.'s body; you have important work to do Sonny Boy, we all love you dearly." After singing another tune Sonny disappeared behind the curtain. Another tall soul suddenly built up outside the curtain, called "Joachim," a young humorous boy, killed in the first world war. Joachim came to each soul, held their hands and gave them his blessing. He called out to Mrs. H.'s godchild, Joan, and her husband who spoke to Joachim; then Joachim said to Joan, "Your husband won't be jealous if I give you a kiss." The husband replied, "No," and he kissed her. Then he looked at me, and took my hands and said he was happy to meet me, a new sitter, and took Herbert's hands and asked the same question as the first. Then he kissed me too, just as if in the flesh. One could feel Joachim's face and lips but we could not distinguish any features of his face as they were robed in the most lovely material of white, soft, silky, woollen stuff, and one could take it in one's fingers and feel the softness of it. They are all robed in this material and have robed cowls over their heads. Joachim also sang a trio with Mrs. H. and P. and joked with them. The name of the song was, "I Love Thee Truly." Then the director of ceremonies appeared. White Wing, a red Indian, tall, beautiful outline of physique and his headgear was oval in form, a semi-circle of white feathers. He had two long black plaits of hair hanging down each shoulder. White Wing spoke to us all in a lovely, deep, strong voice and said he hoped we would be very happy and harmonious, and radiate Brotherhood in this intolerant world. He then held Mrs. H.'s hands and spoke to her. He then stretched out his arms and the material he was robed in hung down from his outstretched arms, giving the appearance of beautiful soft, slightly glimmering, white wings. He came towards me (a tall six-foot-three figure) and asked me if I liked his picture on the wall, as I had been admiring this painting and thought what a strong face. Mrs. H. told me White Wing had been with them for thirty-three years and they had proved that he had never made a wrong statement or move with them. Then White Wing just suddenly disappeared. They often go back behind the curtain to get more power, but often just disappeared into the floor (so it appears to the sitters). When Joachim sang that lovely song, "True Love" in a trio with Mrs. C. and Mrs. H., he said at the end of his song, "Oh, this hot climate of South Africa takes my voice into the basement." We all enjoyed his joke and laughed. A dear soul appeared next after White Wing's disappearance and called out for E. ... . His wife from the second row came forward and recognised her beloved husband. There was great love and rejoicing. She was warned not to cling too long to him as the vibrations of earth are too heavy for them. It was all so sacred and wonderful, too amazing for words. One cannot really describe it in words. To actually see their spirit forms robed in white ectoplasm and feel their robes and hands. To keep vibration going one must sing or talk to each other. Suddenly a soul came straight to me. I arose and he grasped my hands firmly saying twice, "You know who I am." For a split second I peered into the face beneath the white cowl to try and get a closer glimpse, as I thought it may be my father who passed over in 1914. When he said -- as he always used to say to me -- either when visiting us here or when he met us, "Hello you there," I recognised his voice and phraseology and my heart literally jumped for joy. I was so thrilled that I exclaimed loudly, "Docky! Docky!" By this time Herbert also stood up and had recognised his voice and Herb said to me, "It's Dr Murdo MacDonald-Bayne." Docky held my hands and said, "Oh! Grace, it's lovely to see you again, -- it's lovely to see you again!" Then Doc turned to Herbert and said, "Take my hands Harbart and feel them, just like yours in the flesh. I have now fulfilled my promise to you, feel my hands." Which Herbert did. 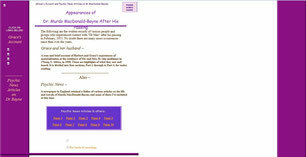 Herbert knew by Doc's voice that it was definitely Dr Murdo MacDonald-Bayne. Then Doc turned to Herbert and said, "Harbart, how is the flow of water on your farm?" All the sitters heard him talking to Herbert. Then Doc said to me again, "Grace how are you?" I replied, "Fine!" Doc said, "You will be coming over here and I will work in the cabin and will see you again." I replied, "How will that come about, these people have not invited me?" Doc replied, "It will all be arranged from this side," then he said, "I cannot stay long, others are waiting." He gripped my hands so tightly that I said, "Oh! Doc what strength you've got," and he replied, "I will get stronger later." It was all too wonderful, his voice exactly in the same tone as then on earth. I sat down as Doc disappeared and was silently thanking Our Heavenly Father for the most wonderful moment in my whole life's experience, when Mrs. H. said to me, "What did Dr Bayne say about working here?" I was in the midst of telling her when suddenly Doc appeared again from the side of the curtain, and said, "Grace, no tales till later on!" We were amazed and laughed at his pun with us. Mrs. H. began to sing again, we all began to sing softly. Doc again took both my hands and I said, "Oh Dockie, we all love and enjoy reading your two beautiful books -- but you were a very clever boy to write them and then to leave us all so that I could not ask you all the questions I intended to ask you on your return to South Africa. My book is full of query marks." Doc replied and said, "I intended to return, but while in London my Father appeared to me and told me I had to come over on this side, soon, as there was work for me to do. I even then did not believe him -- but here I am." I quickly said, "Doc I have two letters here in my handbag from you, written in London to me, wherein you state clearly you would come back to South Africa where you were loved, and you loved the people here." Doc replied, holding my hands in a firm grip and said, "Well Grace dear, am I not here now in South Africa, helping you all?" I was overjoyed and humbly replied, "How wonderful! and grateful thanks, Doc." He then put his arm around my shoulder and placed his other hand on the side of my face and turned towards the little red globe light and I caught a glimpse of his profile. He then kissed me, so gently and tenderly, a wonderful fatherly embrace, and I actually felt his moustache. Then he said, "So long for now, so long for now, (another phrase he often used) Grace and Harbart." No words can ever express my feelings of amazement and joy! I just prayed and thanked the Heavenly Father. God bless his dear, dear, dear soul and for all the loving deeds of healing and teaching he gave to us all while in the flesh on earth. To me it was the greatest privilege to have met him and known him here. Then some other person appeared to some beloved soul and then disappeared, and then two children about nine years of age stood together outside the curtain. The dear, wee souls were strange and shy and did not come towards us although Mrs. H. spoke lovingly and tenderly to them. They just stood for a brief few seconds and then disappeared. They told us afterwards that several spirit souls of folk had built up in the cabin, but were too afraid to come out. Mrs. H. explained they are not used to appearing and have to be assured that it is quite alright to walk out, as their guides and scientist explain to them, because when they walk out, the feeling to them is as though they were on the edge of a balcony. Mrs. H. and sitters said the Lord's Prayer, then the little Sonny Boy appeared and said, "Aunty Louie, Uncle A. [the medium] is sitting against the cane chair and has no cushion." Mrs. H. asked if there was a cushion anywhere on one of the chairs. A person in the second row said "yes," and Sonny Boy walked to the back, got the cushion and took it, and carried it through the curtains to Mr. H. (whom I was told by Mrs. H., was going out of his body). It was wonderful to witness this. After this, the psychic experiment was that we saw H. through the curtains sitting in his chair. One could see his black jacket was open in front due to the heat, and one could see his bare chest. Then, after this, they showed the psychic rod about two feet long, pure white (with what I presume had a lot of ectoplasm on it) and they pointed it towards us. One spirit soul appeared and turned round so that we all could see his upper part of his body and the ribs move as he breathed. He was garbed in white from the waist downwards. Some friend told me that at another sitting, she and her husband actually touched the ribs and it felt just like ours in the flesh. After it was over, Mrs. H. said, "We had a wonderful evening," and bade them all farewell with God's loving blessing. Mr. H. came round and regained consciousness. There was heavy breathing and they said that he should have come back more easily, but for a lady there who would hold on to her husband as he was going. She stood up and followed him to the curtain and Mrs. H. had to gently tell her, and pulled her back. Mr. H. was led out by T.C. to his bedroom and the large electric light was switched on in the passage. We all went into the lounge and had lovely sandwiches, cakes and tea. Herbert and I were standing together at the door of the lounge and Phyllis next to me -- when Mr. H. was speaking to both of us. Mr. H. said, "Mrs. O. [Grace] you have got a Chinese guide," and then turning to Herbert, he said, "a gentle Indian guide is standing behind you." I turned round and said, "I wish I could see him" -- but I could not see anybody. Mr. H. said, "Your guide, Mrs. O.,. says if you are called to a sick bed, you must just place your hand lightly on the chest of that sick person and wonderful healing power will flow through you." Mr. H. said to Herbert that he would draw Herb's Indian guide and turned to me and said, "I may draw yours too, Mrs. O." We were very happy and thanked Mr. H. for his kind and loving thought. Then Mr. H. said, "Dr Mac is here in spirit and is telling me to please tell Harbart and Grace that he wishes to thank us both for the "wee drappie" of whisky, he used to enjoy with us both when he visited us, nearly every Tuesday late in the afternoon. We burst out laughing as this event is perfectly true, and we did enjoy the time he spent with us here at B .... Street, Pretoria, while on earth. We always gave him a sundowner of whiskey and soda. We left the H.'s home at approximately 11.20 p.m. It was a beautiful moonlight night and I drove slowly back to Pretoria. This is a brief account of what happened. It was truly a wonderful and marvellous event and we are both fully convinced it was Dr Murdo MacDonald-Bayne who materialised and fulfilled his loving promise of about 13 years ago -- and materialised three years after his passing over in London, to us at Mrs. H.'s residence on Saturday night, January 1958. Mr. H. told me that Mrs. H., his wife, said she too knew and recognised Doc and said it was the first time since his passing that Doc had appeared in materialised form at their sitting. They knew Doc well in C .... , and Mrs. H. said to me the world is poorer spiritually for his passing over. He was a great soul. God bless his dear soul! The foregoing is a true account of what Herbert and I saw and witnessed at Mr. and Mrs. H.'s sitting. Mrs. C.J., Mr. H.'s god child and her husband, and Mr. and Mrs. T.C. were also with us. By the way, in Doc's book, The Yoga of the Christ you will notice at the end of the book on page 212 [of the original version], that the Master Geshi Rimpoche says, "He will be leaving an indelible impression upon us and there is no need to tell you who he is." I heard Doc was one of the Lord Jesus Christ's disciples. At residence of Mr. and Mrs. H.
Our party of eleven, Mr. and Mrs. C., and J.M., Mr. and Mrs. R. of D .... Street, Mr. and Mrs. H...st., Miss Ida Bagot-Smith and Mrs. T.B., and Mrs. M.M., Mrs. Dolly F., and myself. Herbert, my husband, kindly gave up his place to Miss Ida Bagot-Smith. Dear little Sonny Boy appeared and said that he does not like to talk about himself, so "Aunty Loue" must tell us what he does. Then Rhoan, master of ceremonies, appeared and told us what to do: not to grip their hands and also not to ask, "Who are you?" but say, "God bless you dear soul; we are pleased to meet you; how are you, etc.?" Then dear White Wing appeared and spoke to Mrs. H., thanking her for her faithfulness and then blessed Mr. J.M. and C.M. 's hands and did certain signs on their joint hands giving them power for their work and healing. C.M. said that White Wing put his plait of hair across her hands. Then Mr. H...st's father came. Then Mrs. C.J. 's husband came and we could see his spectacles. They had a wonderful talk. Then!! our beloved Dockie came and said to Mrs. H., "I see you have got my crowd here tonight." He touched all our hands and said, "How lovely to see you all" and greeted by name, C., Dolly, M., and Ida and myself. Then Doc called me out and said, "Grace, stand here." Doc took my hands and placed them on my chest. Doc said, "I will take something from you, and he pulled at my belt. I thought he wanted my belt so I said, "Do you want my belt?" Doc replied, "No." Then I said, "Do you want my brooch?" Doc said "No." And then I looked down and he took yards of ectoplasm from my solar plexus and draped it over my head and shoulders to my feet and said to Ida, "Ida, hold this." Ida held it and Doc said, "Feel this." Ida told me afterwards she was thrilled and the material felt like soft, silky cottonwool, very fine in texture. Then Doc himself turned me round and said, "Can you all see?" All responded and said, "Yes Doc." They all told me afterwards that I was draped exactly as the spirits were when they came out of the cabin and it was beautiful to see. I, of course, only felt the material over my head. A part hung over my right eye and I could not see through it, but was able to see with my left eye. Then Doc said, "Stand very still Grace. I must put all this back again," and he placed his hands on my solar plexus and it was drawn into my physical body. Doc said, "Some will be taken for healing purposes for someone very ill in hospital. You will be tired Grace, but will soon make it up and you will get healing too." -- which I did, thank God. 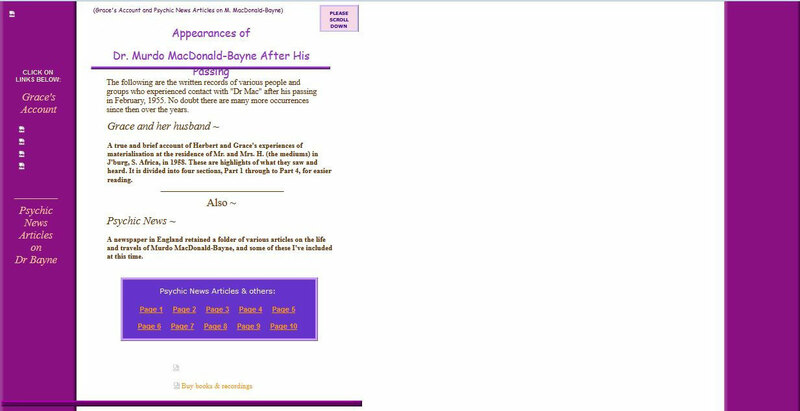 Bob MacDonald-Bayne, Doc's son, wrote to me in reply to my letter telling him about this incident of Doc taking some of my ectoplasm to heal someone. This someone was Doc's son, Bob, who was at that particular time in hospital in London with stones in his kidney (they showed in the X-ray the doctors had taken). In his letter Bob said, "Ha! Ha!, so I have got some of your stuffing in me." The doctors had taken a second X-ray and to their surprise, there was no sign of the stones and no operation was performed on Bob. The day after this incident of Doc taking some of my ectoplasm, I was extremely tired and slept the whole day. The following day I was very well. A beautiful soul appeared, tall in physique, with a long black plait of hair down his back and a round black cap on his head. He said he was Ida's guide and his name was See Long. He brought her courage to persevere with her healing -- a lovely soul. Then Auronama, a wonderful soul, guide of Mr. R., from Astara , came with her hands outstretched together, holding in her palms a lovely, bluish, greenish light, about as big as an electric bulb. She lit up his face, then his heart. The colour of the light reminded me of glow worms. Auronama then told Mr. R. to stand in front and told him that this was the Healing Light, given to him for his healing. I heard Mr. R. say, "How can I thank you?" and Auronama said, "Words, words, no thanks. You have long worked for this and now in your developing silent healing circle you will get results. Place your hand on their side and healing will come." Oh! it was a wonderful sight to behold, such a beautiful soul, so peaceful and lovely as she held the light in her hands. I could see her beautiful face. As she disappeared she stretched out her right arm above her head and gave us all her blessing and the Hailing sign. Mrs. G.'s friend came and called himself R., and it was too lovely when they had finished talking; he stretched out his arm and said to her, "To see you safely to your seat." Joachim also appeared. He sang his trio of "True Love" with P. and Mrs. H and he kissed and joked with Mrs. C.J. Joachim also asked for any other lady and he kissed me. Then he gave his blessing and vanished. At the beginning, Mr. H. [our medium] appeared with one of the dear spirit friends so one could see the two of them standing there - one of the spirits robed in white and Mr. H. robed in black, with his bare chest showing. C.M. 's grandfather built up, stouter and stouter. He called to her and spoke in Afrikaans to her and gave her his blessing and said she would be blessed looking after her mother. Then Dolly F.'s father came; a lovely, tall soul with a Swiss accent. He looked like Dolly with dark hair, long features, and nose and brown eyes. He embraced his loving daughter in his arms and said, "Dearest Dolly, my child, I told you I would come to you." (He had passed over ten years ago.) Dolly laid her head on his shoulder and they just hugged and loved each other -- a beautiful sight of love. Dolly was overcome and could not cease talking about it. We all saw her father. God bless him and Dolly. Dolly asked him if he was happy and he said he was very happy, but was only happy when she was happy. Mrs. H. spoke to Sonny Boy who had materialised and said, " 'Aunty Loue', Ginger (his little friend who was killed in a motor car accident in London) wanted to come and materialise, but the Chemists and Scientists would not let him. He said that if he did not come next time, there would be a 'hell of a row'." We all burst out laughing -- it was so unexpected. Then Sonny Boy said the meeting must close. Mrs. H. prayed too beautifully for words and thanked God the Father for all his Love and prayed for all the sick and suffering on the earth, and blessed our dear Spirit friends -- a wonderful prayer. Our Father was said by all in deep reverence. The atmosphere was too beautiful for words and conditions splendid (Auronama also put a light on the ceiling and said, "the Flame of Light"). Auronama is Mr. R.'s guide. She is a Master and "Astara" sent her name to Mr. R.
Mrs. C.J. was telling us a wonderful healing of the H.'s in their own private circle, of Major B. who was not expected to live and given up by all doctors in J'burg. Yet the night after the H.'s healing circle Major B. got out of bed, healed, and the following night caught a plane to England. My dear, dear guide came, a middle-aged, gentle soul, full of love; said he was my guide and his name was Patau. Patau, is like a French name. He said Dr Bayne had sent him and that often, when Doc was very busy, Patau did his healing. He had healed a lot of the trouble in my spine and in my neck. He also helped me through Dr L., and was still healing and helping my trouble in the bones of my neck and spine and said I would get healed. In sleep he watched over me to see that my head was relaxed and that I did not twist my head or neck. He placed his dear healing hand on my neck for a while (which I must admit was aching and rather taut) and I felt a glow of heat there. Patau said that Dr Bayne had told him to tell me to give all students his Love and that Doc was very busy healing, teaching and lecturing and was always ready to help his students when in trouble or ill health. Patau blessed me and kissed my hands, bowed and said, "Saalame" and said, "God bless you my child. I will watch over you." I was thrilled and awed and thanked him from the bottom of my heart and asked Our Father's Blessing and care upon him. God bless his dear soul -- my guide Patau. I had arranged for a party of ten from Pretoria to meet at the residence of Mr. and Mrs. H., the mediums. Others were there, so there were approximately sixteen folk. Rhoan from the other side appeared and gave necessary instructions. Then Sonny Boy materialised and his little friend, Ginger. Ginger said that it was his own bloody fault that he was killed in London by a bus. Joachim appeared. Mr. P. C-J appeared and Herbert said he could actually see his spectacles on his nose. He had manifested so clearly. He came and spoke to Mrs. H. sitting next to me and said how sorry he was over V.'s (his wife on earth) mishap and said they were giving her all the healing they could. So Mrs. H. said, "We want her to come and stay with us." He replied he would be most grateful to them, if they could persuade her to come and stay with them. Then Dockie came, and when Mrs. H. said, "Whom are you seeking, dear friend?" he replied, "A friend, that's why I'm here." I did not recognise him and he came to me and took my hands and said, "Surely I was with you too long for you not to know who I am." I immediately recognised his voice and exclaimed, "Dockie, Dockie!" I turned round and called, "Herbert, come, it's Dockie," and Herbert and I both saw his face clearly. Herbert, even days afterwards, said that he had seen Doctor Murdo MacDonald's face quite clearly -- only it was (deathly) white. I quickly asked Doc if he had seen his sister, Flora. He replied, "Yes, but very seldom." Doc replied, "Yes, I have seen him, but he works in other realms." Then I hastily asked Doc if he could not materialise to me without me coming over to J'burg to a materialised medium. Doc replied and said, "Yes, when I have got more power, I will do so." I said, "Doc, give me an identification sign." Doc then with his hand and two forefingers, stroked my forehead in line with my nose from the top of the forehead, down, twice, and also the same to Herbert, and said, "This will be the sign. I will not startle you, but I will do this to you and you will feel it on your forehead and you will know it is me." I was thrilled and happy and very grateful. Doc then said, "Tell all whom I knew on earth plane that I am very busy in many circles all over the world, helping and healing wherever I can, and please give them my love." Doc then suddenly disappeared. It just seems as though they are drawn away. Some spirits seem to dwindle down into the floor before one's eyes. Dolly F.'s father appeared and spoke to her and Henry. He told us that he had actually felt on his hands the hard skin, like corns, bumps or welts which he had on his hands while on earth and Henry said he recognised his broad hands and saw his face. Nora saw her grandfather quite clearly. Nora also saw her friend who went to school with her. A couple from Durban saw their little daughter who was nine years of age. I heard her say to her mother and father, "I feel like crying but my nurse is so kind and good to me. And mummie, you must not tear those letters I wrote to you, and have I not grown since I was with you?" The father told me he had positive proof it was his little daughter who had passed over two years ago and he was very happy and deeply grateful to Almighty God for this experience. I phoned Mrs. C-J and enquired how she was two days after May 7, and she told me herself that, although she broke her left arm and cracked up the bone and piece of the bone had chipped off, according to X-ray, the specialist and doctor thought they would have to give her morphia for some days, but they were very surprised as she had NO pain and healing was taking place nicely. Mrs. C-J attributed it to the healing ray given by the Scientists and doctors on the other side -- at our sitting the Scientist shone the light (a greenish blue) inside his solar plexus and lit it up and then dimmed it. Then he appeared again and again lit up his heart centre, and then carried the light in his cupped hands. It was very beautiful to behold. Then he shone a light on the ceiling behind the black curtain. Phyllis C. told me it was the psychic Healing Ray. It was all a wonderful phenomenon. Herbert and myself were waiting to be taken by friends to J'burg to visit Mr. and Mrs. H. [the mediums] at their residence. While waiting I went out in the garden and plucked a pink rosebud from the rose bush in our garden and put it in my brooch, which was pinned on my dress. In doing this my thoughts travelled to the year of 1947, when we gave a party in honour of Dr Murdo MacDonald-Bayne's birthday -- 21st June, 1947 -- in the Baker's memorial hall at the Sunnyside School, Rissik Street. There were approximately 100 guests (I have a flash light photo of this event). We were sitting at the main table. I was near "Doc" (as we termed him). When his birthday cake was cut, Doc took a beautiful pink rosebud, made of icing sugar and gave it to me. I appreciated his loving act and I kept this iced pink rosebud for months. Doc passed over on February 26, 1955. Well we arrived at the H.'s residence at 7.30 p.m., and were introduced to approximately 15 other people. When the sitting began in the Sanctuary, many different beloved ones from the other side materialised, and spoke to their loved ones on earth. Dolly Freitag's father, Mr. T. came again and caressed his daughter, speaking in English to her and to Henry F. in Deutsche-Swiss. Jimmy's guide, Dr. S., came and spoke to him and demonstrated the ectoplasm of Jimmy and robed him with it and showed it to the various sitters for them to touch. The scientist came and called to Herbert and gave him a healing treatment. After, others appeared, Herbert's father, James, came and spoke to him, and we saw his moustache. Herb said it was just the same as when his father was on earth. Herb asked his father how Ma and Tom were, and his father replied, "They told me, (and Tom, Herb's brother), to come and see you here. Herb asked his father about the place where they lived on earth at .... . J. replied, "Yes! we were just talking about Graaff R. and the C. road days the other day." Unfortunately, owing to Herbert being hard of hearing, Herb did not hear all his father said, as his father spoke into the right ear of Herb and spoke for quite a few seconds. Herb's father blessed his son, and as he was going, he grasped Herb's hand, and as he was saying goodbye, he kissed Herb's hand. I shall never forget it -- such a lovely gracious act. Many others came and my thoughts were still thinking of Herb's father, when I heard Mrs. H. saying, "I know who this dear soul is." I looked up, (as I was sitting away next to the wall at the side of the curtain in the front row) and there right in front of me, fully mateialised, stood our dear Doc MacDonald-Bayne. I was thrilled to see him (as I was not at that moment thinking of him). I rose to my feet and said, "Dockie, Dockie, how wonderful to see you again." Doc embraced and kissed me. Doc, when I asked him how he was, replied "fine and very busy." Doc said, "You are well Grace," I replied, "Yes! Thank God." I said, "Dockie, I now wish to take this opportunity to thank you on behalf of all students and myself for what you have done for us and the rich heritage of your books you have left us on this earth. Then I said, "Oh! Doc. I do miss you terribly." Doc replied, "Grace you must realize, I am nearer to you all now than on earth. I am doing the same work, teaching and healing and I am backwards and forwards often in this cabin, but I do not always appear as I am too busy." I said, "Doc, I am doing now, what you asked us to do, when you were on earth." Doc patted me on my shoulder and said, "Grace, you are an apt pupil." I replied, "Doc, I am trying, but I fail so often; suppose I am only human." Doc said, "Grace what did you learn as regards my lectures, that there is no real word such as 'failure'." I replied, "Yes! Doc, I remember." I said, "Doc, I actually dreamt of you some time ago, but I can only remember vaguely parts of the dream." Doc replied, "Yes, I know," and touched the right side of my temple with his forefinger and said, "Grace I am trying to get your head right, so you will remember." It sounded funny, I could not help laughing and Doc laughed too (it was too lovely to hear his laugh again -- a gurgling mischief laugh like he had on earth: I should say an infectious laugh). I replied, "Oh, Doc, it would be fine if I could remember." Doc said, "Many of your students attend my classes on the Astral plane." I said, "Oh! how lovely. I only wish I could remember and bring the experience through." I said I had written to his son, and I was glad to see (Doc) your books published again and on the shelves in the book shops, and I asked him if his last two books would be published again. Doc did not reply. Then I suddenly said, "Doc, do you remember, while on earth, the incident of the iced pink rosebud that was on your birthday cake?" Doc replied, "Aye I do," and Doc then touched the rosebud on my dress. I quickly took it out of my brooch and said it was like this and I gave it to him. He held it in his fingers and said, "Grace, is this for me?" I replied, "Yes! Dockie, for you with all my love." Doc then lifted his ectoplasm silky white robe, and took the pink real rosebud and said, "Grace, I shall place this rosebud under my heart and always keep it there as a spiritual link between us." I was so amazed, as I realized I was talking to a materialised Dockie. Doc then said, "I must go now, so long for now Grace," and he disappeared. I stood, then sat down and just wondered about it all. I am only relating briefly the experiences of others and myself there, and many I have not even mentioned here. When the sitting was over, about 10.30 p.m., we left the Sanctuary and went to the lounge for tea and sandwiches. Phyllis C., their niece (being unwell) was not present, but her husband, T., was present. Dolly and I and Mrs. H. helped with the tea. I specially asked Mr. and Mrs. H. (the mediums) to please see if Doc had left the pink rosebud in the Sanctuary. When I phoned the next day Mr. H. answered and said they had searched everywhere and Doc must have dematerialised it and taken it with him. Mr. H. said this also happened long ago in Cardiff, a similar instance took place. He said we must now see, when we go again (probably next year), if Doc may materialise it and we will then note that it would be as fresh as the day I plucked it in the garden. Months passed when Herbert and myself went over again during winter to the H.'s residence for a materialisation. In fact, I had nearly forgotten about the incident of the pink rosebud, when Behold! dear Dockie came for a little while and called to me to come from my seat and gave me a dear little pink rosebud. I said, "Oh! Dockie, where did you get this real little pink rosebud from?" Doc said, "Never mind Grace dear, it is yours with fond love from me." I kept it as long as I could and then pressed some of the petals, when it began to wither, between the pages of a book.